Kurlee Belle: 2 Ways to Revive Naomi Campbell's 'Barely There' Hair! 2 Ways to Revive Naomi Campbell's 'Barely There' Hair! 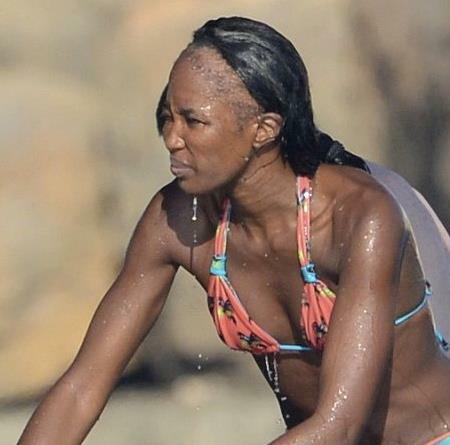 If you have not seen the horrible swimsuit pictures of Naomi Campbell's hair line floating around, then you must live under a rock. This is not the first time that Naomi's 'barely there' edges have been exposed to the public. The paparazzi was really wrong for publishing this photo of the Jamaican-British bombshell on vacation in Ibizia. So how can we transform the disaster in the above picture to this? The solution is not simple but with a little help from her Russian Billionaire boyfriend Vladislav Doronin, anything is possible. Of course, her lack of edges can be from a medical condition found in many black women called Alopecia or from excessive styling. If the latter is true, she can revive her edges through TLC. Mega Tek is a growth aid originally formulated for horses, but has been tested and approved for human use. This product stimulates and promotes rapid hair growth without the use of synthetic polymers, oils, or petroleum based products. Mega Tek strengthens and accelerates hair regrowth and gives the appearance of longer, stronger and healthier hair 10% to 50% faster. Researchers have found that Vitamin E contains antioxidants that increase scalp circulation stimulating growth and preventing hair loss. Vitamin E can be applied to the scalp by breaking open vitamin E capsules and gently rubbing the gel onto the hairline. Other great sources can be found in vitamin E serum, dark leafy vegetables, eggs, nuts, and vegetable oil. Get it at your local Whole Foods, Pharmacy or Earthfare. Bonus solution: Stop wearing heavy sew-ins!!!!!! Give your hair a rest from all the tension and wear wigs. I know you are a Supermodel and all but it is not rocket science. Wow!! She should try a hair restoration Toronto treatment, because she doesn't look anymore like a supermodel. I'm thinking why she didn't do anything, when she has millions in her "pocket". However, I'm sure that sooner or later she will fix this "little" problem.